Ynys Llanddwyn or Llanddwyn Island is a small tidal island off the west coast of Anglesey (Welsh: Ynys Môn), northwest Wales. 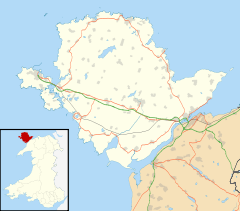 The nearest town is Newborough. The island is of geological interest with pillow lava, jasper formations and aeolian sand deposits. The island forms part of the National Nature Reserve of Newborough Warren which includes the extensive and floristically rich sand dune system. Ynys Llanddwyn is a tidal island; it remains attached to the mainland at all but the highest tides. It provides views of Snowdonia and the Llŷn Peninsula. The island is very rich in legends, and in particular the association with Dwynwen. The name Llanddwyn means "The church of St. Dwynwen". Dwynwen is the Welsh patron saint of lovers, making her the Welsh equivalent of St. Valentine. Her Saint's day is 25 January and is often celebrated by the Welsh with cards and flowers. The island bears the ruined remains of St Dwynwen's Church. There are more than 10 miles (16 km) of footpaths crossing Ynys Llanddwyn and Newborough Warren, including the Anglesey Coastal Path, and it is a very popular place to visit. The island provides a worth-while goal after the mile-long walk along the beach from the nearest car park. Ynys Llanddwyn, with the neighbouring beach, has been awarded Blue Flag beach status in recognition of the cleanliness of the sea and the beaches. Tŵr Mawr lighthouse marks the western entrance to the Menai Strait. 1873 Construction of lighthouse on Ynys Llanddwyn. 1903 Closure of the lifeboat station on Ynys Llanddwyn. 1911 RSPB Cymru opens in Llanddwyn Bird charity born 100 years ago at Llanddwyn Island. 3 December 1920 - Five crew members from the Rhoscolyn lifeboat are lost off Llanddwyn, Anglesey. In 2004, Ynys Llanddwyn was used as a filming location in Demi Moore's romantic thriller Half Light. Tŵr Mawr was used as a lighthouse which plays a key role in the film. CGI was used to create the effect of a real light on top of the lighthouse. Tŵr Mawr lighthouse and cross at Llanddwyn. Wikimedia Commons has media related to Ynys Llanddwyn. Anglesey History History of Llanddwyn Island. This page was last edited on 13 December 2018, at 11:10 (UTC).